Most of the paintings that Henri Matisse made in Nice in the 1920s feature female models in richly decorated hotel interiors. Breakfast depicts nineteen-year-old model Antoinette Arnoux in the artist's opulently furnished room at the Hôtel de la Méditerranée. Seated, with a book on her lap, Arnoux has a contemplative, self-absorbed pose, as if lost in thought. The color, pattern, and brushstrokes that animate the room around Arnoux are typical of Matisse's Nice period, but the feeling of ennui, the sense of intimacy, and the emphasis on the psychological state of the model mark a distinct departure from the artist's earlier work. Josse and Gaston Bernheim-Jeune (personal collection), until at least 1931 (Bernheim-Jeune photo no. 3201, May 1920) . With Bignou Gallery, New York, (from Bernheim-Jeune?) ; sold to Samuel S. White, 3rd (1876-1952), Ardmore, PA, by summer 1947 ; bequest of Vera White (Mrs. Samuel S. White, 3rd) to PMA, 1967. 1. The 1931 Basel exhibition catalog lists the painting as "Collection Bernheim-Jeune, Paris" (not for sale, according to the catalog). However, the firm's archives indicate that the painting never formed part of the gallery's stock, according to director Guy-Patrice Dauberville (letters of 10 September and 25 October 2003, in curatorial file), so it therefore must have belonged to the Bernheim-Jeune private collection. 2. 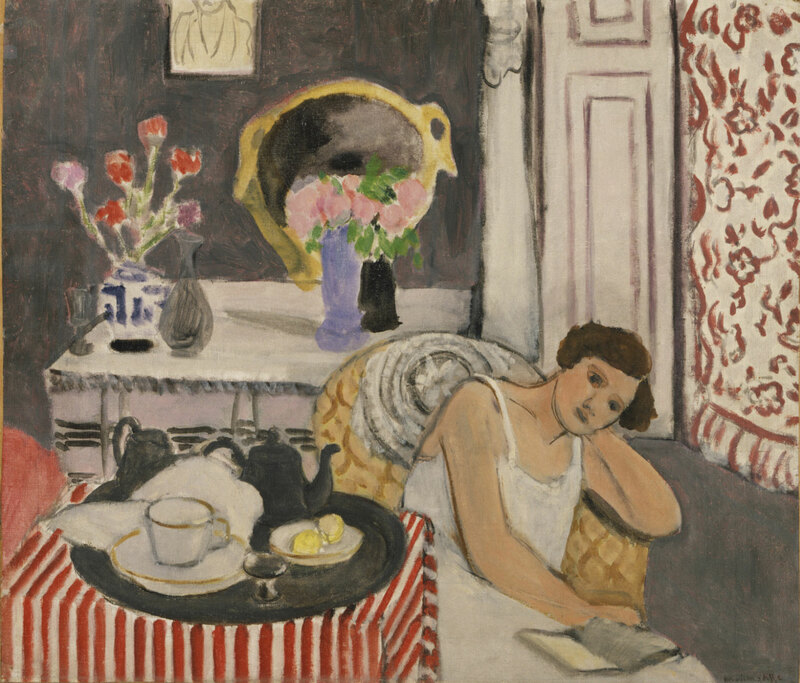 Étienne Bignou was associated with Matisse's dealer Bernheim-Jeune (they had been his partners in the purchase of Galerie Georges Petit in 1929). The New York branch of the Bignou Gallery opened in 1935. The painting was included in the Bignou gallery's 1947 exhibition "A 20th Century Selection." The Bignou photo album (Frick Art Reference Library) does not record the provenance of the painting. 3. White lent the painting to the PMA exhibition, "Masterpieces of Philadelphia Private Collections" in summer 1947. He may have purchased the work at the time of the 1947 exhibition at the Bignou Gallery.